dedicated monthly desks allow you to establish a base. For an introductory offer of just £199 a month, you have optimum freedom: your own spacious desk is accessible 24/7, with lockable drawer unit. Like starting work at 4am on a Sunday? You’re nuts, but the choice is all yours! 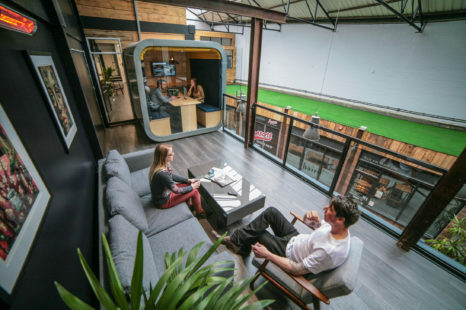 With free scanning and printing, fibre connection, free tea and coffee, and access to our impressive meeting space, your business has all it needs to succeed. We also boast awesome ping pong and fussball tables to help you play as hard as you work! Foundry 17 has its very own, brand spanking new shared workspace. It’s a place for businesses to come together and enjoy a work environment that’s open, spacious and super-contemporary. Foundry 17 is a shared workspace in the heart of Exeter. The office space is open, spacious and super-contemporary. As well as showcasing your business’s forward-thinking attitude, you’ll seduce your clients and customers in a space that is impressive and immersive. Our high-quality, super-sized, tech-enabled desks will accommodate every project, within a business community bursting with energy.